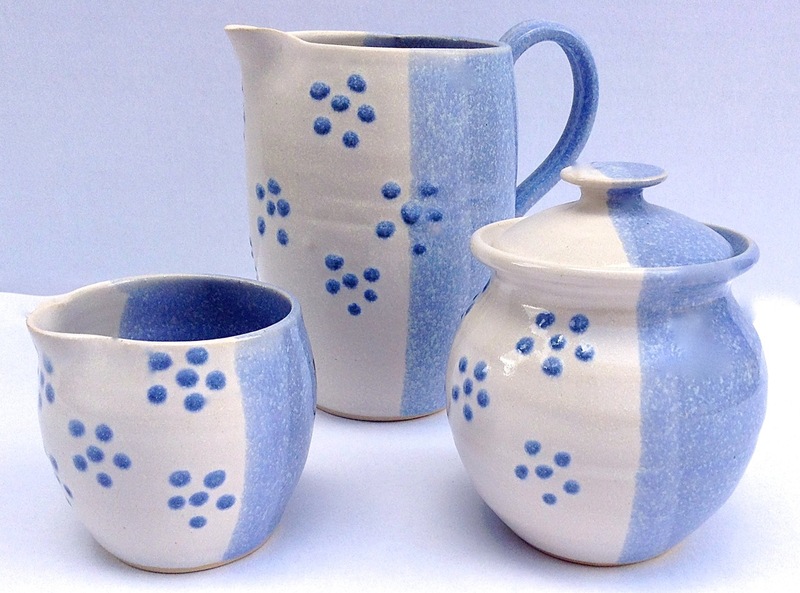 Here is a small selection of our new pottery range by Castle Arch Pottery, made by Ray Power a Cork man living in Kilkenny for some time. Each piece is made in small production batches on the potter’s wheel, allowing great attention be paid to decorative details such as handles, sprigs and to the fluent slip-trailed decoration with embossed surfaces. The penultimate stage sees each piece bisque fired to 1000cc before the final stage of glazing and firing again to 1200cc. This guarantees the pottery will be both microwave and dishwasher safe. This traditional approach, typical of Irish country potteries, ensures that Castle Arch Pottery maintains its unique character. With their distinctive blue and white polka dot design, Castle Arch offer something a little different that would look just as well in a country kitchen as in a contemporary apartment. It’s proving to be a very popular wedding gift with customers picking up such popular pieces as cake stands and vases. All made in Ireland, we love their designs and quality. We have stocked Ireland’s Eye Knitwear in the shop for many years now. They are based in County Dublin and produce some really beautiful knitwear. From Aran Sweaters to high end Wool Cashmere, many of their pieces have been shown on catwalks around Europe in particular Paris. Our feature image above is their Shanagarry Coat, a wool/cashmere blend, luxurious and extremely soft to the touch, incorporating a central cable stitch down the centre back, Ireland’s eye always manage to combine tradition with elegance.